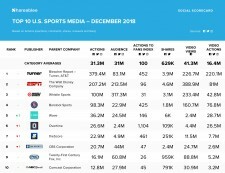 NEW YORK, January 9, 2019	(Newswire.com) - Shareablee Inc., the global leader in audience-based social media measurement, today released their December 2018 ranking of the most socially engaged sports media brands across the United States. Sports media brands dropped 1.6 percent overall and represented a total of 970.7 million actions (post-level reactions, shares, comments, retweets, and likes) across Facebook, Twitter, and Instagram in the last month. 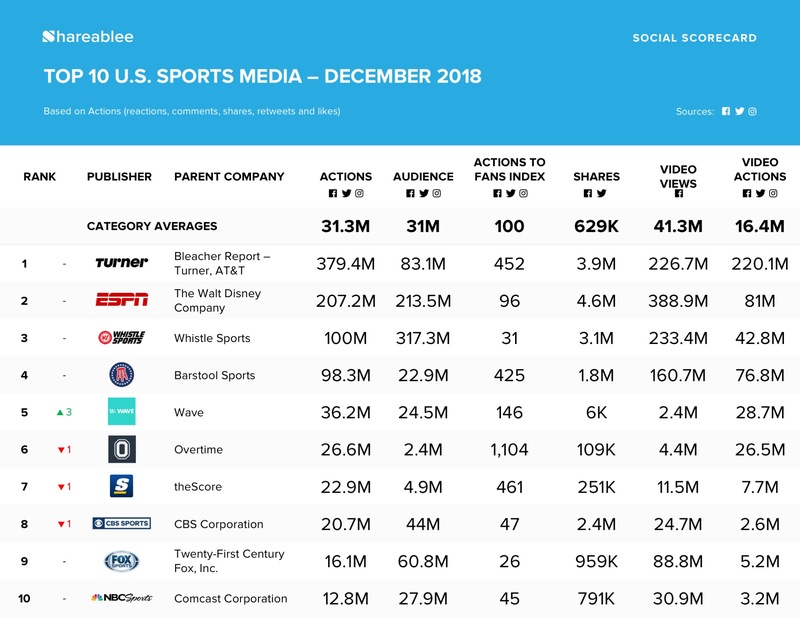 The Bleacher Report-Turner Sports Network led the ranking with 379.4 million actions, followed by ESPN (207.2 million actions), Whistle Sports (100 million actions), Barstool Sports (98.3 million actions), and Wave (36.2 million actions). ESPN ranked first in the video category with 388.9 million views last month. Whistle Sports came in second with 233.4 million while Turner Sports came in third with 226.7 million. Wave has been steadily increasing in terms of number of engagements, going from being ranked 8th to 5th from November to December (passing Overtime, theScore, & CBS Sports), and jumping up from being ranked 16th to 8th from October to November. The fastest growing number of engagements U.S. Sports TV Network in December was TYT Sports (ranked eleventh), with 1,075 percent growth in overall engagement since last month and 7,725 percent growth since December of 2017. This huge increase for TYT Sports was driven by activity around a couple popular stories: A wrestler who was forced to cut his dreadlocks by a referee before a wrestling match, and the second about an autistic basketball player going to D1 college.